Today I found out why onions make you cry. Onions, along with many other plants in the Allium species (garlic is another popular one), absorb sulfur from the soil. When onions are chopped, it ends up breaking cells within the onion, which releases certain enzymes. These enzymes then react with the sulfur, creating amino acid sulfoxides. These, in turn, create the highly unstable syn-propanethial-S-oxide, which is a combination of sulfuric acid, sulfur dioxide, and hydrogen sulfide. When this substance, in a gaseous state, comes in contact with the moisture in your eye, it triggers a burning sensation via the ciliary nerve. Tears in the eyes are regulated by the lachrymal gland, which is situated just above your eyelids. When the brain gets a message that there is an irritant in the eye, such as the above syn-propanethial-S-oxide, which gives a burning sensation, it then kicks the lachrymal glands into overdrive, trying to flush the irritant out of your eye(s) with tears. Cooked onions won’t produce this same effect because the process of cooking the onion inactivates the enzymes needed to make the syn-propanethial-S-oxide. So you can safely chew the cooked onions without getting teary-eyed. Refrigerate the onion at least 30 minutes before cutting. Alternatively, put the onion in ice-water for a few minutes before cutting. By cooling the onion, you will slow the enzyme/sulfoxides reaction rate, minimizing the syn-propanethial-S-oxide production. Turn a fan on, blowing across the onions and away from you. Run water over the onions as you cut them. The syn-propanethial-S-oxide that cause the eye irritation is water soluble, so can simply be washed away before having a chance to get in the air. Cook onions often. 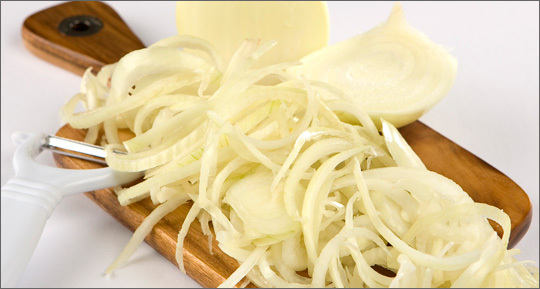 Research has shown that the more you cut onions up, the less the sulfuric compounds will affect your eyes. Why Do Asian Nations Use Chopsticks? Why is Cheddar Orange When Milk Is White? Is White Chocolate Really Chocolate? Onions are an extremely healthy thing to eat. They are brimming with vitamins C, B1, B6, G, potassium, phosphorus, fiber, protein, and starch. They also have been proven to lower cholesterol; reduce chances of a stroke; reduce chances of various types of cancer; work as an anti-inflammatory agent; relieve hypertension, hyperglycemia, and hyperlipidemia; make an effective anti-fungal agent; and a decent anti-bacterial agent, among other things. 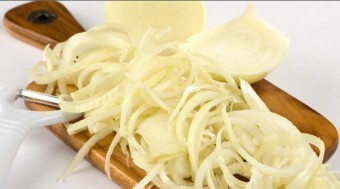 Sweet onions harvested in the spring and summer won’t induce nearly as many tears as fall and winter onions. Researchers in New Zealand have recently created a “tear-free” onion. Basically, they genetically engineered a new type of onion that handicaps the lachrymatory enzyme, so the syn-propanethial-S-oxide never gets created in large quantities. Thus, reducing the “tear” effect caused by the cutting onions. The peak “eye watering” time for an onion is about 30 seconds after you cut it. From there, the effect diminishes rapidly and is gone completely within about five minutes after cutting. What is the chemical process that causes my eyes to tear when I cut into an onion? AAS: Why Do Onions Make You Cry? I found the easiest way to avoid onion tears is to just wear my contact lenses. You can wear some swimming goggles. I heard somewhere that clenching your teeth while chopping onions prevents the tearing. That has worked for me but I can’t remember the reason for it working. I think that’s the basis of the other option I’ve heard passed around: chewing on some bread. Chewing gum works….I do not know why. This is incorrect….breath through your MOUTH…not your nose…and no tears…so the article cannot be correct stating contact with your eyes, I think it goes in through your nose and into your sinuses…. Actually wearing my contacts while cutting onions does work. Is onion having any bad effect to the eyes apart from tears? Such a wonderful and interesting piece of article I love the details…..
To Zak: if you THINK it goes in through your nose and into your sinuses….. then how can you CLAIM that the article is INACCURATE genius??? I dab vinegar on my wooden cutting board ~ not having a plastic or glass board, am sure that would work too. Any sort of vinegar or a lemon juice should that be at hand. I cant beleive this because when I cut onions I hold my breath. I really do. When I want to breath I turn 180 degrees – that 1/2 a circle. Bend down where there are no gasses and take a fresh breath again. hold breath. Chop Chop Chop and start again. No tears. But When I dont do the above I cry like a river. Which sense would onions making your eyes water be? Is it a 6th sense or would it be classed as touch? If so wouldn’t smell also be touch?